Parisians continue to mourn for all the victims of the terror attacks, and some are expressing anger as the gravity of the situation sinks in. PARIS (KABC) -- Parisians continue to mourn for all the victims of the terror attacks, and some are expressing anger as the gravity of the situation sinks in. Monday night was a wet and cold one in Paris. Raindrops have doused most of the candles at the memorial sites - their warmth is no longer comforting. Dozens of people were killed in multiple acts of violence across Paris on Friday, including shootings at restaurants and a hostage-taking at a music theater. It's as if the gravity of what happened in this city is finally sinking in. Parisians are now dealing with unbearable sadness. Friday night, a gunman stormed into a bar and restaurant called Le Carillon first and started shooting innocent people just out enjoying themselves. He then crossed the street right over to a Cambodian restaurant, where he began doing the same thing. Twelve people were killed in the intersection between the restaurants - one of them 23-year-old Nohemi Gonzalez from Southern California. 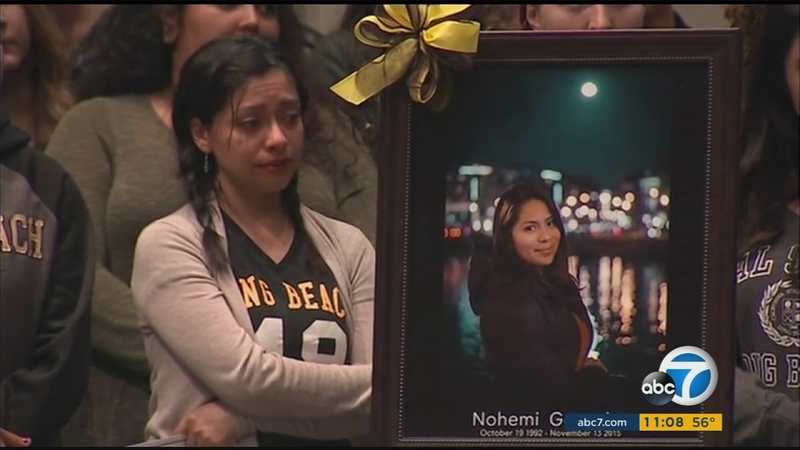 CSULB held a vigil Sunday afternoon to remember Nohemi Gonzalez, the 23-year-old industrial design student who was killed Friday in one of six terrorist attacks in Paris. From El Monte, Gonzalez was a design student from Cal State Long Beach, eating at Le Petite Cambodge with some of her friends. It's as if the gunmen were targeting people like her. Throughout the memorial at the restaurant, you'll find pictures of the other victims - young adults, mostly women. The photos show happier times and selfies that were never intended to be sitting in the rain. 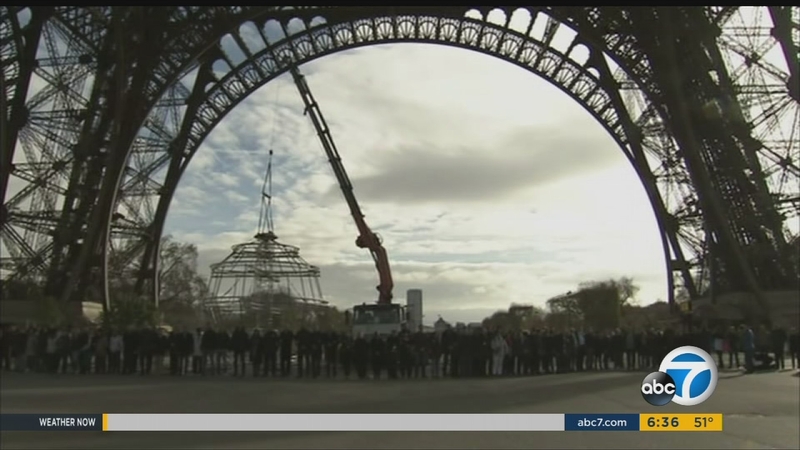 Hundreds gathered at the iconic Eiffel Tower on Monday and held a moment of silence to honor the victims of the terror attacks in Paris. You'll also find bullet holes. One on a wall is marked by a Post-it note that reads "no more." The holes in the cracked windows are now filled with flowers. Paris resident Cecile Thevenin said the attack and the scene of the horror stirs different emotions inside her. "Some anger and some sadness. I want to cry really because when you see the bullet holes, you just know that it happens," she said. This Monday began with people heading out to work - many of them leaving their homes for the first time since the attacks. They are just now seeing these heartbreaking memorials in person and it's too much to bear for most, standing strong but still very much in pain. Three teams of attackers including seven suicide bombers attacked the national stadium, the Bataclan music hall and nearby nightspots Friday. In addition to the 129 people who were killed, the attacks also wounded 350 people, 99 of them seriously. 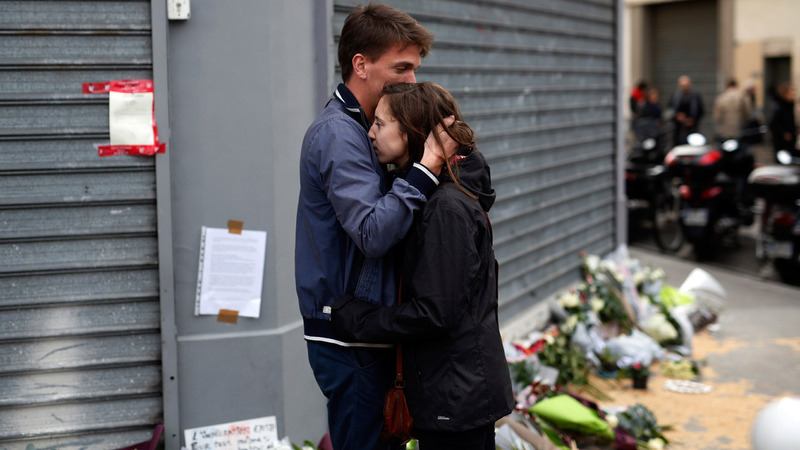 The Islamic State group has claimed responsibility for the attacks.